Basically I barely had time to review this shampoo and conditioner properly before my boyfriend stole it, ate it and I found an empty bottle lying around. He says its great for his white afro hair and that it makes it super super super soft. He keeps on asking if I have more of it, and I even ordered a new bottle for his next birthday. I kind of hate this shampoo a bit because, after my boyfriend discovered how much he likes it – he realised that I use high quality stuff, and hasn‘t stopped going through my things – leaving my shelf full of empty bottles after each romantic visit . So what did I think of this duo? I feel that my hair is more soft after use, and look more “alive” (the summer lifts my spirit but kills my hair, so I need all the moisturizing my hair can get) and gives it a great shape. I‘m fond of the smell too, since the shampoo and conditioner smell of a hair saloon – but in a good way, not the plastic fantastic way. You need little per use which is great to. The minus is the price. The volume only lasts for a day. Having flat hair, I constantly crave volume. Trying saltwater helped a bit (mix hot water with salt, let it dry and use to give your hair a nice beachy look)..but I wanted something more sustainable, which did not dry out my hair. This lotion promises to strengthen, moisturise, and add volume. Your hair is basically supposed to get a dramatically increased volume, so I got super excited and though this must be my new it product. My verdict is that you do get some volume, using it straight after washing my hair I could really tell the difference. I have medium thick hair and this lotion could handle it well. 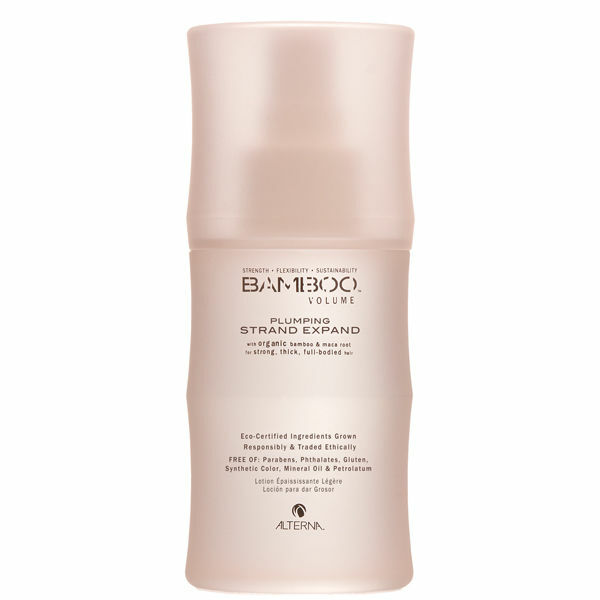 I see added volume, but my hair still remains light and shiny, and does not turn oily. But you have to use a substantial amount each time (3 pumps for my short hair), and you can only see that great volume for a day, afterward my hair returned to its old gloomy self. It smells lovely, and is free of parabens and sulfates.